The T-72 is a Soviet second-generation main battle tank that entered production in 1970. It was developed directly from Obyekt-172, and shares parallel features with the T-64A. The T-72 was one of the most widely produced post–World War II tanks, second only to the T-54/55 family, and the basic design has also been further developed as the T-90. 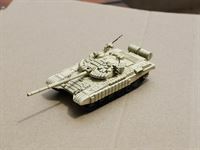 Modelcollect AS72027 T-72B with Era, it showed Russia army's T-72B in Russia-Georigian war, performed Modern Russia T-72B's improvement, new Rubber front render, real Reactive armour style, and command shield. TOS-1 (Russian: ТОС-1 - тяжёлая огнемётная система, English: Heavy Flame Thrower System) is a Soviet 220mm 30-barrel (original system, Ob.634 or TOS-1M) or 24-barrel (Ob.634B or TOS-1A) multiple rocket launcher and thermobaric weapon mounted on a T-72 tank chassis. TOS-1 was designed for defeating enemy personnel in fortifications, in open country, and in lightly armoured vehicles and transport. First combat tests took place in 1988-1989 in the Panjshir Valley during the Soviet war in Afghanistan. The TOS-1 was shown for the first time in public in 1999 in Omsk. The T-72 is a Soviet second-generation main battle tank that entered production in 1970. It was developed directly from Obyekt-172, and shares parallel features with the T-64A. The T-72 was one of the most widely produced post-World War II tanks, second only to the T-54/55 family, and the basic design has also been further developed as the T-90. 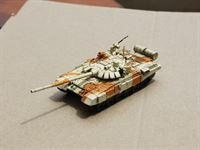 T-72A is the second Ver. of T-72 Seres. It added laser rangefinder and electronic fire control, turret front and top being heavily reinforced with composite armour (nicknamed Dolly Parton by US intelligence), provisions for mounting reactive armor, smoke grenade launchers, flipper armour mount on front mudguards, internal changes. produced on 1985，Big turret of T-72 series. TOS-1 was designed for defeating enemy personnel in fortifications, in open country, and in lightly armoured vehicles and transport. New main gun, stabilizer, sights, and fire control, capable of firing 9M119 Svir guided missile, additional armour including 20 mm (0.8 in) of appliqué armour in the front of hull, improved 840 hp (630 kW) engine.